Legacy Habitat Management has over 10 years experience installing newt fencing, temporary amphibian fencing & reptile fencing. Our specialist, trained team offer professional, high quality installation for all newt fencing projects. We operate a wide range of custom designed installation equipment, allowing us to install newt fencing in all ground conditions. Legacy Habitat Management has over 10 years experience installing newt fencing, temporary amphibian fencing and reptile fencing. Our specialist, trained team offer professional, high quality installation for all newt fencing projects. Legacy Habitat Management works with a wide range of clients and ecologists and is the UK's leading installer of newt fencing on power stations, pipeline corridors, wind farms, industrial developments, land fill sites, quarries, road building projects, motorways, wetland habitats, brown field and green field sites. We operate a wide range of custom designed installation equipment, allowing us to install newt fencing in all ground conditions, quickly and efficiently, whilst maintaining a sensitive approach to other flora and fauna. We can offer design solutions for all your newt fencing projects and can advise on the best products and installation methods so that trapping and surveying periods are maximised. Designs may incorporate water permeable ditch crossings, newt proof road crossings and access gates, pitfall traps and refugia, solutions for installing on hard ground coverings, and other site specific design requirements. Our Caudon® Temporary, Semi permanent and Permanent fencing systems offer a range of price, durability and suitability dependant on site requirements. All work is carried out in line with English Nature Great Crested Newt Mitigation Guidelines, and in accordance to any relevant licensing. Although the term newt fencing has been applied to the protection of many species of newts and other amphibians, it usually refers specifically to Great Crested Newts (GCN's). The Great Crested Newt (Triturus cristatus) and its habitats are protected by the Wildlife and Countryside Act 1981 and the Habitats Regulations 1994. They are also classified as a European endangered species. It is an offence to deliberately kill, capture or disturb a great crested newt, or damage, destroy, or interfere with its habitat. The presence of great crested newts, or great crested newt habitat on, or near to a development site may require that the developer takes appropriate action to ensure newts do not enter the site, or that great crested newts are collected from the site and translocated to suitable habitat (under licence) where they will not be endangered. Legacy Habitat Management offer a number of newt fencing solutions to help protect against the loss of great crested newts and their habitat allowing developers to progress a project legally and with minimum disruption. We will chose the most reliable and economical products from our range of Caudon® Newt Fencing Systems depending on site conditions and required longevity of the installation. We are also a recommended installer and supplier of ACO Wildlife Products. The Caudon® Permanent Newt Fencing system has been designed to provide an extremely tough and highly damage resistant newt fencing solution when installed by our team of experienced contractors. Permanent newt fencing is the ideal long-term solution for perimeter newt fencing on sites where there is movement of personnel, plant or other traffic. It consists of a 4mm thick, recycled HDPE panel with a 50mm return folded and welded into the top edge to form an overlap, as per the English Nature Great Crested Newt Mitigation Guidelines. Permanent newt fencing panels are stabilised against ultraviolet (UV) light for up to 15 years and are very suitable for long term installations. A newt fence panel rental service is also available as an alternative to the more traditional purchasing option, please enquire for further details. Caudon® Semi-permanent Newt Fencing still provides a very tough, damage resistant newt barrier but may prove to be more cost effective if a very long-term solution is not required. The main advantage of this system lies within the installation technique used by Legacy Habitat for this product. We can install this 1mm thick, HDPE material as a continuous length for long runs. 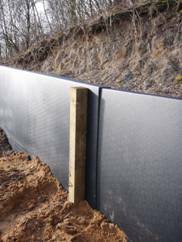 Unlike the panel system of the permanent newt fencing, it can be installed with no joins in the material for up 200m. This minimises weak points in the fence which can be an issue with other newt fencing systems on the market. The specialist installation method employed by our contractors also creates less ground disturbance which can be a plus on sensitive sites. Installation in this manner can vastly reduce installation times, a saving that we can then pass on to you or your client. Semi-permanent 1mm panels are also available and both forms can be purchased from www.wildlifefencing.co.uk. Commonly known as TAF (Temporary Amphibian Fencing). Caudon® Temporary Newt Fencing offers the most economical newt fencing solution for shorter term projects or where human disturbance is minimal. 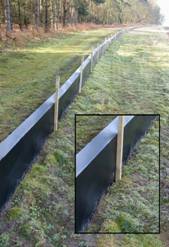 It is also the ideal solution for creating drift fencing within a great crested newt trapping enclosure, when installed in conjunction with pitfall traps. Our 1000gauge polythene temporary newt fencing can be installed quickly and efficiently by our experienced team of installers as per the English Nature Great Crested Newt Mitigation Guidelines. Temporary newt fencing is stabilised against ultraviolet (UV) light damage for up to 2 years. It is installed from 100m rolls ensuring that joins in the material are kept to a minimum and rolls can be easily man-handled. We also have specialist equipment to handle larger rolls of temporary newt fencing for longer join-free runs. Our toughest newt fencing installation. This system is suited to sites where there is a high risk of human disturbance or vandalism. The material, a galvanized steel panel has a lifespan of 20 years plus and can be installed without the need for supporting stakes. For further information and technical specification, please visit our Caudon® product pages.